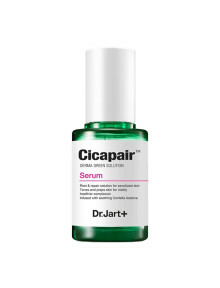 A highly concentrated, fast-acting serum that soothes skin sensitivity while calming redness and irritation. This soothing and luxurious serum is designed to calm skin irritation with potent capsules containing centella asiatica, an Asian herbal plant commonly referred to as tiger grass that is known to aid in skin recovery. It leaves overly sensitive or red skin looking and feeling more comfortable. 1) Apply a moderate amount onto skin on toned skin. 2) Gently pat to allow for maximum absorption. 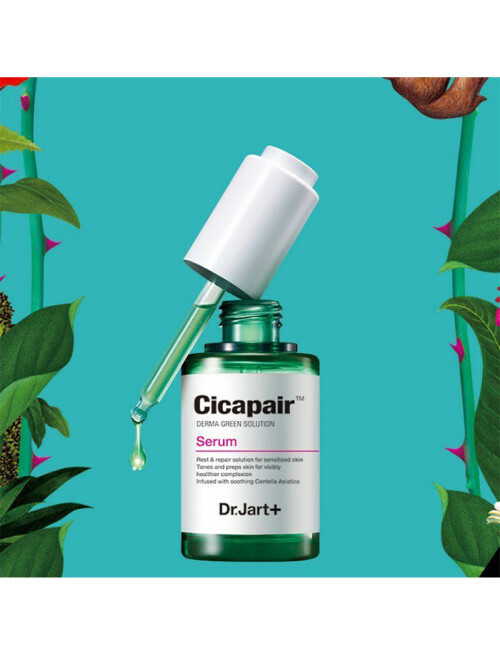 3) Follow with Cicapair Tiger Grass Cream (sold separately) for more hydration and soothing benefits. -Centella Asiatica Complex (Madecassoside, Madeecassic Acid, Asiaticoside, and Asiatic Acid): Helps protect skin from stress. -Herbs Complex (Houttuynia Cordata, Yarrow, Resurrection Plant) and Chlorophyll: Support skin’s barrier.-Minerals Solution Botanic Complex (Sodium, Potassium, Calcium, Magnesium, and Osmopur): Soothes skin.